162 spacious studio one and two bedroom suites feature the wonderful Gainey Suite Dreams Bed with plush down featherbed and pillows and new LCD HD Flat Screen TVs. FREE Wi-Fi HSIA throughout the resort and work areas with ergonomic desk chairs halogen lamps and laptop size safes. Complimentary breakfast buffet with Starbucks Coffee and an evening hors d oeuvres beer and wine reception daily. Make yourself at home with a fully equipped residential style kitchen and dining area with granite countertops. 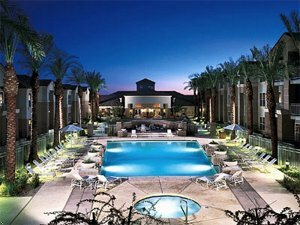 Relax in the oasis-like courtyard with heated resort pool whirlpool and newly remodeled Fitness Center. Flexible well appointed function space with secure WiFi and wired HSIA including a ballroom that accommodates up to 150 people. State-of-the-Art audio / visual services Business Center and on site creative catering for corporate and social events. Next door explore The Shops-Gainey Village with fabulous boutiques and great restaurants. Pamper yourself at The Spa at Gainey Village or tee it up at some of the best golf courses the Valley of the Sun has to offer. Its all waiting for you at the Gainey Suites Hotel. Directions to Hotel: From Phoenix Sky Harbor Airport take the East Valley Cities, Loop 202 exit heading east. Proceed on Loop 202 EAST for approximately 5 miles bearing right as you approach the loop 101 turn-off and take the 101 NORTH/SCOTTSDALE ramp (to your LEFT). Proceed on the 101 loop North and get off at EXIT 43, Via de Ventura. Go left (WEST) and proceed on Via de Ventura for approximately 3 miles, making a LEFT turn at GAINEY SUITES DRIVE. Just around the curve on our right you will see the entrance to the hotel, turn RIGHT into the driveway to the entrance. The property does not have onsite food and beverage facilities.